I’ve been so behind on my video game playing lately that, just as jefbot in today’s strip, I’ve been trying to catch up on a bunch of games before their sequels come out. But how important is it that I do this for the sake of “story”? While I’ve been enjoying the world of Borderlands, am I going to be lost if I don’t find out how things wrapped up trying to find The Vault before playing Borderlands 2? While I haven’t finished Darksiders, I’m pretty much sure I’ve been spoiled on the ending just from the scant marketing materials I’ve seen promoting Darksiders II. And while I’ve been enjoying the surprisingly dark storyline (for a Pokémon game anyway) for Pokémon: White will I seriously be lost if I don’t finish before Pokemon Black & White 2 comes out in a few weeks? Probably not. While there are a few games, like the Mass Effect series and Bioshock where I’ve been completely engrossed in the story, most games have a simple narrative, mostly just to get you from point A to point B. Heck, most of Nintendo’s franchises have kept the same storylines and character motivations since the early ’80s! But will I finish rescuing Princess Peach for the zillionth time in the first New Super Mario Bros. before getting New Super Mario Bros. 2, which was released a week or two ago? Of course. But I think that has more to do with me having some sort of obsessive completionist streak than anything having to do with story. i gotta beat Dead Space 2 as well, Zac – the stuff i’ve been hearing about DM3 sounds cool! By the way I can’t I reach the site through my browser! hmm. let me know what browser you’re using. how are you seeing this? through your phone? Oooh, so close this time. Anyway, I can relate to this strip. I always like to see the first movie in a series before the sequel. I can also relate to being behind in my video game playing. I have games entitled Gauntlet Legends, Nightmare Creatures and two Tomb Raiders games that I haven’t had time to play what with working two jobs and getting my apartment in shape for inspection. so close – keep trying, Rainey! Borderlands!!! Will you be lost? No, I highly doubt it. The ending is terribad! The game is magnificent, but when you finish it feels very… anti-climatic. You also never really find out WHO your vault hunter is. Supposedly they are fixing this with the sequel, the original characters will now be quest giving NPCs and tell you there stories, so I’m excited about that. i’m happy you commented, cixelsyD, and thanks for reading! and i can see why your wife’s so addicted. it’s one of those games where it can be 2 in the morning and you’ll still be like – just one more quest! then i can go to sleep. cut to 5am in the morning and you’re saying the same thing. heheh. I’ve resisted the lure of so many games in the last year, so I could meet deadlines and see my family once in a while, that I’ll have to retire to catch up. sounds like you’re in the same boat i am, Sarah W: work, family, friends, personal projects, videogames? something’s gotta give. I just…ok I don’t get this comic. Ok no, I “get” the comic, I just don’t get the need to finish one game before starting another. Maybe because I’m not a die hard gamer? I mean I enjoy my games and I play them and I finish 75% of the ones I play. But I stretch it out over months sometimes years before I finish them. I guess it’s the impatience in me? I get frustrated so I put it away for a while til I can look at it a different way. Sometimes, I play them in reverse. Like I played Kingdom Hearts II, finished it, and went back and started the original. I am stuck on it of course! So yeah, not a die hard gamer. Please don’t take my Geek Girl CRED! I’ve got it all sparklie and pretty just the way I like it! oh, and NO ONE can take away your GGC! I get it…believe me. After my PS3 died, I had to replay the two games I cared about, just to re-get the trophies I lost, and have the appropriate save files for the next one (Dragon Age: Origins, where the ending and choices made influence Dragon Age 2). Fortunately, there aren’t many games I’m really into. I’m still working on Persona 3 and 4, but that’s…don’t take this the wrong way, but it’s such a typical JRPG (minus the oversized swords Yahztee’s always going on about). So much grinding…I guess that’s the case in every RPG, but I notice it more with the Persona games. I do love the stories, though, so I keep coming back hoping I’ll find out what in the hell is actually going on. i feel ya with Persona, T. i played a bunch of P3:FES on my PS2 a long time ago, but then picked up P3P for fun, thinking i’d finish THAT then go on to P4. only got about 1/3 of the way through before picking up something else. i’m sure now that they’re making Persona games for the current gen consoles, i’ll go back and finish them, but really – like you said JRPGs are pretty typical, and the stories are so “out there” that it’s almost impossible to take them seriously. i’ve played most of the Kingdom Hearts series and still have no idea what’s happening! I’ve never actually finished either of the Persona games. I keep getting to certain points and either moving away from the person who owned the PS2 I was playing on, or my PS3 crashed, or something like that. I think I’ve started Persona 3 four or five times and never gotten past summertime. Kingdom Hearts is so hard for me to navigate, I just couldn’t get into the first game at all! and KH is worth playing – the design and cool fantasy of the worlds is pretty awesome – it’s just the story is so insane, i think you’d need to do some heavy wiki research just to make sense of what’s going on! VIDEO GAMES! I think it’s good to see an update on video games instead of movies, just to shake it up. Man, I haven’t been playing the major consoles for quite a while. (I don’t think iPads count.) I still have my X-Box 360, but the controllers were missing. They’ve been found a few days ago! Hooray! But the games we have here are still old. (last played it 2009-10?) So I have Halo 3, Iron Man 1… really old games. On iOS I play a lot of modern games, (not my iPad though, it’s for the family). You’ve probably heard of TapTap Revenge, I mean who hasn’t? But if you want a big challenge, try Jukebeat. The app is free with 3 songs included (but boy, music packs are expensive>>>3 songs=$3.99). In TapTap, you have 3 circles to tap, in Jukebeat you have a 4×4 grid to tap! If you look on YouTube, you’ll find the extreme difficulty as hard as fudge. So start on beginner or advanced; it’s really easy. Also, Infinity Blade 2 is pretty decent. I hear it’s on sale now! From $7-ish to $3 for a limited time. yeah, i’ve recently gone back to my XBOX, ROM!, mostly due to trying to finish Borderlands before Borderlands 2 comes out. snuck a little Arkham City in, too, which i’m finding difficult to just pick up and play from where i left off due to the controls being so complex. i do spend some time here and there playing iOS games – most recently DragonVale, 10000000, Cthulu Saves the World, Pitfall! and Scramble. i’ll give Jukebeat a try when i get the chance since i thought TapTap was pretty fun. will give Infinity Blade 2 a chance, too – once i finish Infinity Blade 1!!! I haven’t played any new games (or many old ones) because I never got to finish storylines. Lacking an xbox or playstation kinda means I’ll just have to wait and wait and wait, and then get caught up in a series of frantic weekends. Mostly cause I am an obsessive completionist but oh well. That’s the price I pay to play. I play all my games for the story. Great gameplay is killed by poor story in my book. like Crysis 2… sigh. Anyway I dont mind spoilers as long as I dont get them 30 seconds before im at the stage I would fing out myself. otherwise I tend to seek spoilers when the mood comes to me. i wish games focused more on story, Maryz! like a lot of hollywood blockbusters, i feel like the story is the last thing the developers concentrate on, which is a shame. and i try to avoid spoilers for things i’m most interested in – like the ending to Mass Effect 3, which i still haven’t started! I have my copy of borderlands in my ps3 waiting patiently for me to finally finish it.. Unfortunately I have to restart the game from the beginning because my old ps3 died just as I was at the end. I’ve had lots of interest in getting around to it again but I just didn’t have any time. Borderlands is a great game, Satoshieyes! hoping if i put enough time in over the next few weekends, i’ll be finished with it before the sequel comes out. the story, however, is almost non-existent, and a friend who finished it says the ending’s pretty lame. sad, cuz with a compelling story, i think my enjoyment of it would go up even more. I used to worry about that too until I realized that half the time I hardly remember the plot from the game before anyway. That’s what happens when games take about three years to deveolp. The only game I actually remembered the plot well was the God of War series, and I think that’s because the plot was pretty simple, yet compelling, and the game play was beyond amazing! I played Gears of War 3 recently and execpt for Felix I didn’t really remember anyone else, I even forgot that one of his squad members was his brother. that’s the prob, TPC: these games have such forgettable stories and characters! hopefully, in the next generation of consoles, the developers will realize just how important story is to the experience. we’ll see. i hope you find the time to play all those games on your next break, dj! how’s Conquest? worth getting? the stuff i’ve seen online for it looks cool, but i figured i’d put my time into finishing up Poke:White before the sequel comes out. Conquest is fun, its not a game I’d pick up ordinarily but its a good afternoon waster.. I hate falling behind on my FUN! If only we didn’t have to have jobs!!! it has its nerd raging inducing moments though, but its a very good game. aagh! see, now you’re going to make me skip finishing the first Darksiders, steve! To be honest, I don’t buy too many games anymore. I just play my favorites over and over until I can find every item and short cut by instinct. Books on the other hand, oh man, I am the Jefbot of the world of books. My room actually has stack of books everywhere. You know, I think I’ll stay off my computer for a few days, just so I can make a dent in this mess. So, see you when I finish a few fictional adventures. Pokemon White does have a good storyline and yes, it is surprisingly dark for a Pokemon game. While I’ll try to not give anything away I will tell you that you should get White 2 as the differences in the story between Black and White are carried over to the respective sequels. Though you probably knew that already, I just felt the need to tell you anyways. yeah, i was hoping to get Black for the sequel since Black Kyurem looks awesome, GB, but looks like i’ll have to go with White to carry over my progress. or i’ll just have to play Black 1 just so i can play Black 2 which i’m seriously considering. my team’s all over the place at the moment – not using much strategy, just picking pokés i like: Pignite/Suicune/Victini/Throh/Raikou/Pansage right now. The Pokemon I used to beat my White version were Serperior, Liepard, Simipour, Gigalith, Zoroark, Sigilyph, Glavantula and Chandelure. Yeah, I had to keep rotating them, but it added to the challenge because I didn’t level up as fast. When it comes to online battles I use many different Pokemon, like Gardevoir and Blaziken. My strategy most the time is to use weather or statuses a lot. Okay, I read your entire archive this morning and I know I saw one in which your sister Xinda “facebooked” you, but now I can’t re-find it. Help? first of all, thanks for going through the archive, Bender_Sastre! 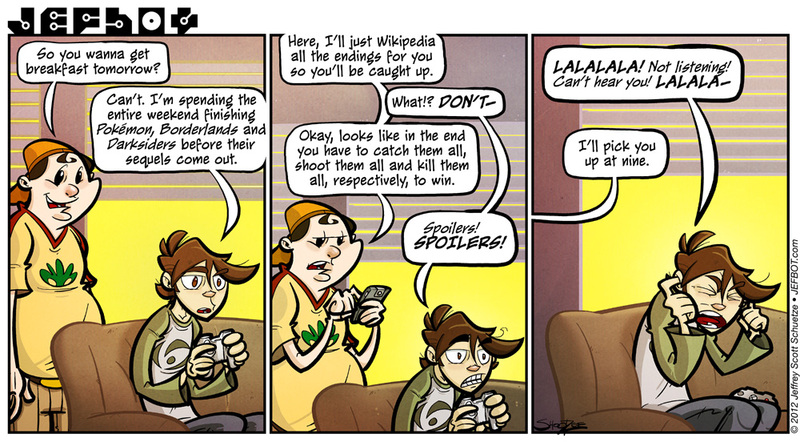 second, here’s that “facebook’d” strip: JEFBOT.229_Hardcover. I have a tendency to grab both Pokemon games at the same time. I like how they changed things up a little more in version differences. It used to be just a difference in Pokemon available, but with the advent of the 5th generation, I’m expecting even more variations, between the two version in the future. Supposedly, they’ve got a contract deal for 15 or so total generations (geez, that’s gonna be over 3000 Pokemon give or take, depending on how many new ones they introduce). I’m eager for the new games (first direct sequels). It’s rare that they add on a new section to explore (twice so far, with the Sevii Islands on FireRed/LeafGreen; and the new areas available in Black2/White2). Frankly, if I had my way, I’d make a Pokemon MMORPG. I’d like to do it, but don’t know how to go about getting a game proposal done up (frankly, I’d like Blizzard to do it, their Art Department is phenomenal). i used to get all the different versions too, KB, but now i’m lucky if i have the time to complete just one, so i usually decide on one version, then the “enhanced” version. (emerald/diamond/etc.) this direct sequel thing for the current game is interesting. and, YES TO PokéMMO. i’ve always thought this as well. if Nintendo wants a GUARANTEED homerun success with their next console (Wii U), they’ll do this! Well, if they DO do one, I want the credit for the idea (yeah, like that’ll happen); BUT if I can come up with the Game Design Document, I can get the credit as a designer! That’d be hoopy! It’d probably have to be outsourced or on the Wii U as you say. I don’t know how the Nintendo Wireless works (I’ve never been able to do it with ANY system; I keep getting a can’t connect message). Do you think they’ll release updated versions of Ruby/Sapphire/Emerald? Maybe StarRuby and StarSapphire? I liked generation 3, even though most people say they sucked. Big Bang Theory season 6 should be starting soon…can’t wait! They need to ask you to do at least one episode, that’s be epic! Especially if Wil Wheaton was there too (OOH, maybe you’d be one of Wil’s friends!). Well damnit, I just finished reading the whole strip and am caught up. you are now the tenth webcomic I must wait for now. This is the most painful process. Before it was quick action, now it is the grueling wait for new strips. Great comic though. and if i may ask, how’d you find the strip? Can’t wait for Pokemon! Especially since I’m in a marching band and our away games take forever to get to! ooh, transport to away games is the perfect time to catch ’em all, GG! i take it you’ve finished Black and/or White 1? I’m the same way. There are quite a few sequels I have not picked up because I haven’t finished the games before them, i.e. Mass Effect, Uncharted. And while I have beaten Pokemon Black, I essentially stopped after beating the Elite 4. I hear B&W 2 do give you some extra scenes, fleshing out the events between the two games, depending on how far you get with the original B&W. Feels weird not commenting on stuff so here goes: I hate it when people spoil movies, books, and games. I use some cheats but I never check whats gonna happen in the very end… I have actually been a very big Nintendo gamer, until I kind of lost some games (lended them to friends and forgot to ask them to give them back) but since I get more money from my parents due to me being the only child living at home right now, I might just become a geek gamer again.